Last week’s Supergirl had a rather game-changing ending as one of the big secrets of the season — to the characters, not to the audience — was finally revealed to everyone. It sets up the final part of the season as Supergirl (Melissa Benoist) and her allies will be taking on Reign (Odette Annabel) and the Worldkillers. 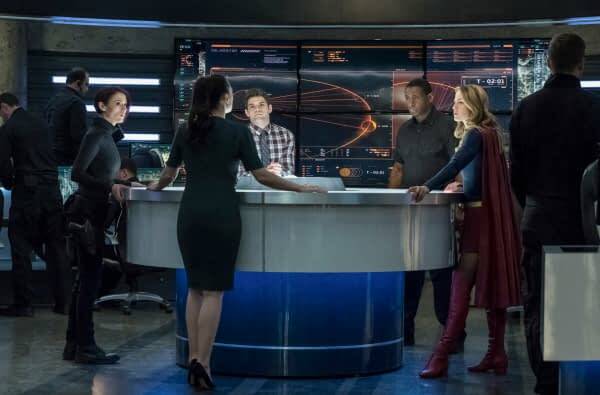 The CW has released a new clip from tonight’s episode, ‘Trinity’, shows us Lena Luthor making her first trip to the DEO. Spoilers ahead. The clip follows up the reveal that Lena (Katie McGrath) had discovered that Sam was also Reign and had been experimenting on/treating her for a while without telling anyone. Now Lena is in the DEO at a table with Supergirl, J’onn J’onzz (David Harewood), and Alex Danvers (Chyler Leigh) answering questions about why she was harboring and aiding a fugitive for three weeks without contacting them. Lena points out, very succinctly, that she was helping a friend, and that no, she never had any thought about contacting a clandestine agency that she’s never been formally made aware of. In truth, her argument is rather sound legally, but this is obviously going to cause a problem between her and Supergirl. Not only for the keeping the secret, but for the fact that Lena possessed and was using Kryptonite to control Reign. Supergirl airs tonight at 8 p.m. ET on the CW.